I remember the first time I read No Meat Athlete. It was a few months after my first marathon, and I was just starting to transition into a vegetarian diet. “Just starting to transition” is the key part of that sentence because really I was only limiting myself to local meat and barbeque. That’s right, anything labeled barbeque was just fine. See, I wanted to go vegetarian, but I was skeptical. I was skeptical about how it would affect my running. I was skeptical that I could still go out and actually eat something fun. I was skeptical that going veg wouldn’t automatically turn me into some sort of holier-than-thou lame-o. Then the girl I was dating (who is now my wife!) sent me a link to a recipe on some site called No Meat Athlete. No Meat Athlete, huh? Interesting. Within minutes on the site I was diving in head first, reading as many articles as I could get away with during work hours. I was hooked by the author, Matt Frazier’s, laid back approach. How he gave advice and information in a non-preachy, “it worked for me, it might also work for you,” kind of way. Slowly, that skepticism faded away and I started dropping meat entirely from my diet. But what I found more powerful than the no-meat stuff was how Matt’s blog was encouraging me to push myself. I was setting bigger, bolder goals, and before I knew it, I had goals to improve my marathon time, cut out milk and dairy, even run an ultramarathon (which was huge for me at the time). Through the blog, he encouraged me to dream big and form habits that last. It worked. Over time I got to know Matt through more than just his writing. I’m happy to now call him a good friend, my mentor, and even boss (if you haven’t figured it out, I work part-time for the No Meat Athlete Team). We even have a podcast together. When Matt first told me he was going to write a 250+ page book and plan a cross-country book tour at the same time, I knew he was being ambitious. I knew he was setting a massive goal which could totally lead to failure. But I also knew he would do it. I had the privilege of reading an advance copy of the book, which officially released this week, and it is exactly the type of powerful material you’d expect from Matt. The book is split into two sections: nutrition and fitness. The nutrition section focuses on the benefits of moving to a plant-based diet in a very approachable, easy to understand way, and includes a number of delicious recipes. The fitness section is all about taking steps to reach the level of fitness you desire. It’s chock-full of training advice, how-tos, and even training plans from 5k to half marathon. And while the No Meat Athlete concentrates on the plant-based diet and fitness (entirely written in that non-preachy, “it worked for me, it might also work for you” attitude we know and love from Matt), the overarching theme throughout the book is setting goals and forming lasting habits that help you achieve those goals. So I decided to call Matt up, steal a few minutes of his time right before a New York City book tour event, and discuss that very idea: The importance of setting big goals and forming habits that stick. The interview is short, less than 15 minutes, but packed full of goal and habit advice straight from the guy who helped shape me into the runner I am today. 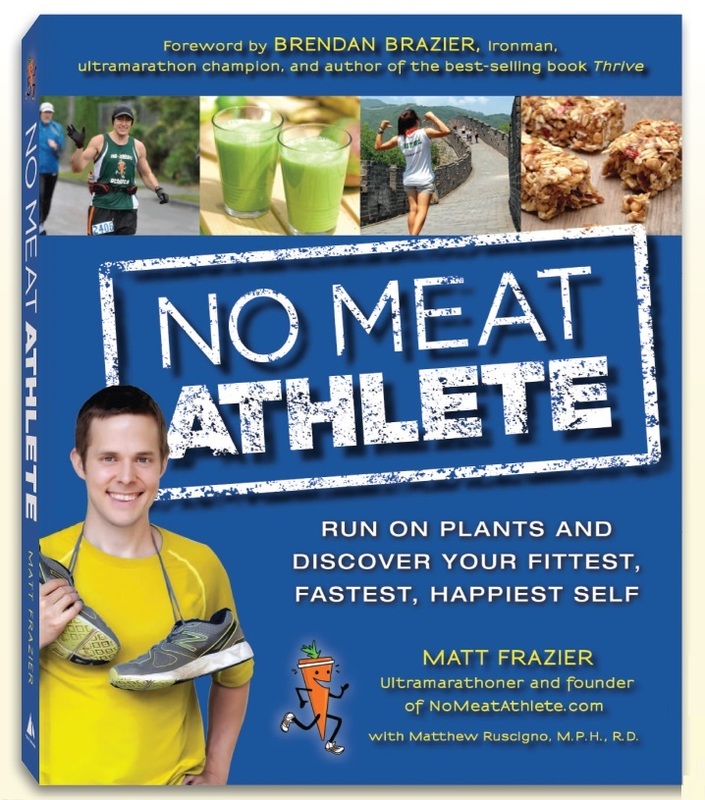 No Meat Athlete: Run on Plants and Discover Your Fittest, Fastest, Happiest Self is now available at Barnes & Noble, Amazon, IndieBound, and QBookshop, and you can catch Matt at dozens of cities during his cross-country book tour. You can meet and speak with both of us this Saturday during his DC stop at Cause PhilanthroPub, and I’ll also be joining him throughout Arizona and Texas in November.